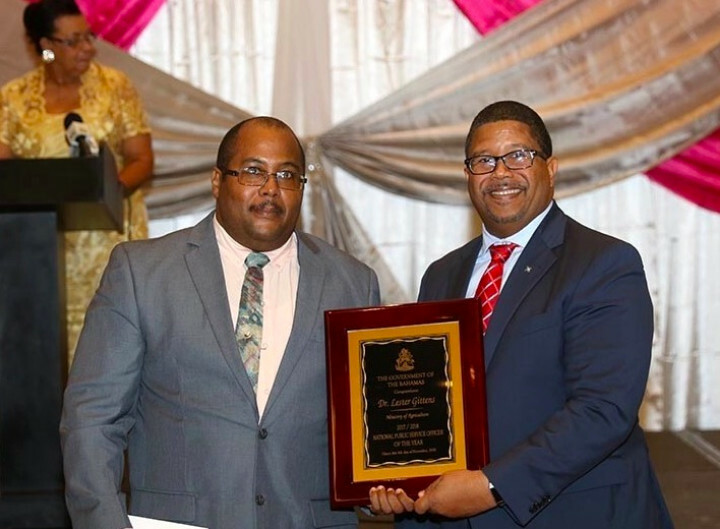 Nassau, The Bahamas - Ministry of Agriculture and Marine Resources Fisheries Officer, Dr. Lester Gittens was chosen 'Public Service Officer of the Year 2018/2019' at the 18th Annual National Public Service Week Awards Luncheon and National Public Service Officer of the Year ceremonies on Sunday, November 4, 2018 in the Imperial Ballroom of Atlantis, Paradise Island. Dr. Gittens is pictured, left, being congratulated for his achievements by Deputy Prime Minister and Minister of Finance, the Hon. Peter Turnquest. Dr. Gittens is currently Supervisor of the Science and Conservation Unit of the Ministry of Agriculture and Marine Resources. His very specialized training in Natural Resource Management and Ecological Sciences have been valuable to his keen interest in Bahamian spiny lobster fishery -- its conservation and marketability.